Talking to camera in the ad, Brown says "Americans go through security before they get on a plane, enter a government building, or attend a ball game. But folks who come here illegally, they just walk across the border. That's wrong. Thanks to the pro-amnesty policies of President Obama and Sen. Shaheen, we have an immigration crisis on our hands. We respond with compassion, but it's time for us to secure the border once and for all." The Brown campaign says it's spending six-figures to run the spot for a week on WMUR and WBIN, the two commercial television stations in the Granite State, and on cable TV. The campaign also says Brown's the first Senate candidate in the country to run a TV ad over the border crisis. The influx of Central American children trying to cross the southern border, many of them unaccompanied, has been a major media story over the past month and a half. The White House and many Democrats have clashed with Republicans in Congress and governors over who is to blame and what should be done about it. The surge appears to be fueling a notable shift in American attitudes toward immigration policy with border security growing in importance, according a CNN/ORC International poll. The poll, released last week, indicates that 51% now say the government's focus, when it comes to immigration policy, should be formulating a plan to stop the flow of undocumented immigrants. Forty-five percent say the top priority should be developing a plan that would allow undocumented immigrants who have jobs to become legal residents. That's a change from February, when Americans said 54%-41% that legal status trumped border security. More than three-quarters of Republicans questioned in the survey say beefing up the border trumps legal status for the undocumented. And those are the voters Brown is trying to rally. Brown, a former senator from neighboring Massachusetts, sold his home in the Bay State late last year and moved his residency north to New Hampshire, where he owed a vacation home and where he spent much of his childhood. In April he formally launched his Senate bid in New Hampshire. According to the most recent poll, Brown is the overwhelming favorite to win the September 9 GOP Senate primary over former U.S. Sen. Bob Smith and former state Sen. Jim Rubens. But the same NBC News/Marist survey also indicates Brown trailing by eight percentage points in a November showdown to Shaheen, who also served for six years as the state's governor. "Even republicans recognize that Scott Brown's campaign is failing to gain traction and this negative ad reeks of desperation. 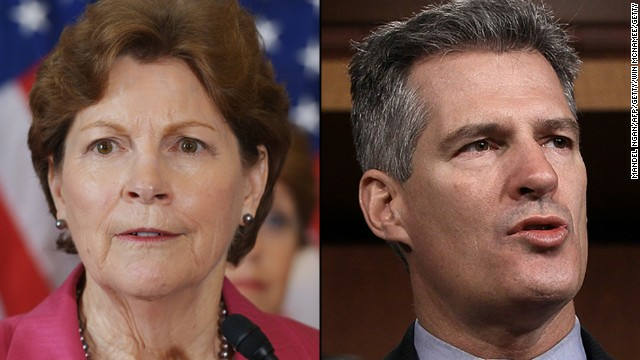 Scott Brown knows both Jeanne Shaheen and Kelly Ayotte voted for a comprehensive immigration reform bill that strongly increases border security," said New Hampshire Democratic Party Communications Director Julie McClain, in response to the spot. The commercial is Brown's fifth since he launched his bid in the spring. But it's the first one to focus entirely on one issue and not include any part of Brown's biography. Brown's been trying to raise his profile in the state since moving from Massachusetts late late year. Shaheen, who is well known in New Hampshire, has not had to tout her biography in her campaign commercials. Democrats have a 55-45 majority in the Senate (53 Democrats and two independents who caucus with the party). But in the midterms, the party is defending 21 of the 36 seats up for grabs, with half of those Democratic-held seats in red or purple states, like New Hampshire. WILL YOU PLEASE JOIN THE NATIONAL PHONE-IN CAMPAIGN TODAY? We are paying for a toll-free number to the Capitol Switchboard to make it as easy as possible for all of you. Call toll-free: 1-855-827-2353 Even though most Democrats in the House are currently supporting any kind of amnesty they can get, Democrats as well as Republicans need to be called today. It is important for Democrats - three months before elections - to hear just how unpopular these amnesties are. More than anybody else in Congress in recent years, Sen. Sessions has stood up for immigration policies in the interest of American wage-earners and their families. We definitely owe it to him - and to our national community - to respond with a phone call to our U.S. Representative today. The reason we are focusing on the U.S. House of Representatives today is because that is where the main action is taking place right now on the President's request for billions of dollars to deal with the Border Surge in the Southwest U.S.
30 years ago includes both Bush, Senior & Junior era. Do you mean Dems could had closed the border while these two Presidents were in power and doing nothing regarding the border?????? It is clear that Senator Shaheen has been a party to the Obama policy of encouraging illegal Immigration. This will only make it more difficult for Americans to obtain a good job at good wages.It will also increase the number of poor people needing welfare and free medical care. Shaheen and Obama's policies are destroying the country. The labor market is being flooded with cheap labor. Shaheen has also supported Obamacare which is going to bankrupt this nation with higher healthcare insurance premiums. Shaheen is not just pro choice she is pro abortion and has been a party to encouraging abortion as a means of birth control. Scott Brown is the kind of honest leader that is needed to turn this country around. Take back your country and support Scott Brown. Come on now Lily...... We never had such a large influx as in the past year.... plus these illegal aliens were invited by Obama to put pressure on the Republicans to have a vote on immigration reform...... but it backfired... big time. Your Government in Action. How many of these border jumpers will be deported? Answer NONE!!! And just think, all your Liberal Buddies are going to send the Bill to who? YOU!!! Hey, more Food Stamps !!! Okay. Obama campaigned on many things. Closing the border and immigration was two of them. When first elected Obama had both Houses of government. Why didn't anything get done? Why now, just before another election is the man that immediately put more K-Street Banksters in his administration than any other administration before him, do something then? Can anyone that still supports Obama answer me that? Why now, just before another election, are we hearing of this false-promises yet again? I would like to know how this "champion-of-the-poor," false-profit can tell us how allowing millions of illiterate, unskilled, sick and dependent illegals into our country, at a cost of average of $375-per-day, per illegal, for a minimum 3-yrs is ... h-m-m ... doing the math ... that's ...WHAT!!! ................$410,625,000,000.00 !!! We have 2,000,000 homeless American children. We have over 200,000 homeless veterans. Think that kind of money would help them? Think it would help us? How can we morally justify taking care of someone else when we can't take care of your own? Obama's just blowing-smoke. He's there to fool the drooling TV-watchers, (you can fool some of the people all of the time). Obama will write some EO that will draw the ire of the corrupt establishment Republicans, and they'll both blow-smoke at us, and nothing will get down. Voting will not get us out of mess we're in. Not unless We the People take-over the poles. The proof that voting is corrupt is too obvious to have too try to explain. Unless we have publicly counted ballots, with a paper receipt, you can never be sure your vote was counted. Obama beating his chest using children for political gain is beyond comical. It's beyond insane. It's pure, unvarnished, irony, and evil of the kind that should give rise to revolution!